Earthrace, the out-of-this-world sea-going powerboat which earlier this year was foiled in a bid to break the current round-the-world record of 68 days after damage caused when it hit wild Mediterranean storms, is back on track for another bite of the cherry. Tenerife was deprived a view of the extraordinary vessel on that occasion, but now it looks as if we might be luckier the second time around. Earthrace is being prepared for a March start in Valencia from where she will be heading directly for Tenerife, making the trip in three days flat. After a brief re-fuelling stop the boat and her four man crew will make for Puerto Rico and then on to the rest of the round the world itinerary: Panama Canal-Acapulco-San Diego-Hawaii-Marshall Islands-Palau-Singapore-Cochin-Salalah-Suez Canal and then back to Valencia. And all on bio-diesel! Because make no mistake, Earthrace is no ordinary powerboat. She is a showcase of environmentally friendly technologies of which bio-diesel is just one component. She has low-emission engines, non-toxic anti fouls and a super-efficient hull design. A prototype, in fact, for powerboats – and other vessels – of the future. 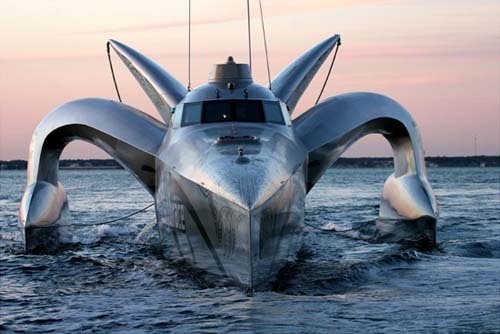 Earthrace is described as a wave-piercer, meaning she can submarine through waves and can in fact go up to 7 metres underwater as she does so. This enables the boat to maintain a higher average speed through big seas as compared to a conventional craft. And if the thought of that doesn’t make your stomach heave, you want to be part of history and have some spare dosh – quite a lot of spare dosh actually – skipper and Earthrace Project founder Pete Bethune of New Zealand wants to hear from you! “We are looking to add one extra person to the four man crew for each leg of the race. I’d be delighted to hear from anyone who wants to be part of our amazing experience,” he said. And with prices starting from €10,000 for one of the shorter legs of the voyage, it brings a whole new perspective to the cost of a no-frills trip!